Just a couple months ago, Google announced the free version of Google Optimize, their newest product for running tests websites. If you haven’t signed up for the free version, it’s currently running in a closed beta and you can request access here. I was lucky enough to be granted access and the product truly meets the hype. This product is the next evolution of Google Experiments, which has been around for quite some time now. 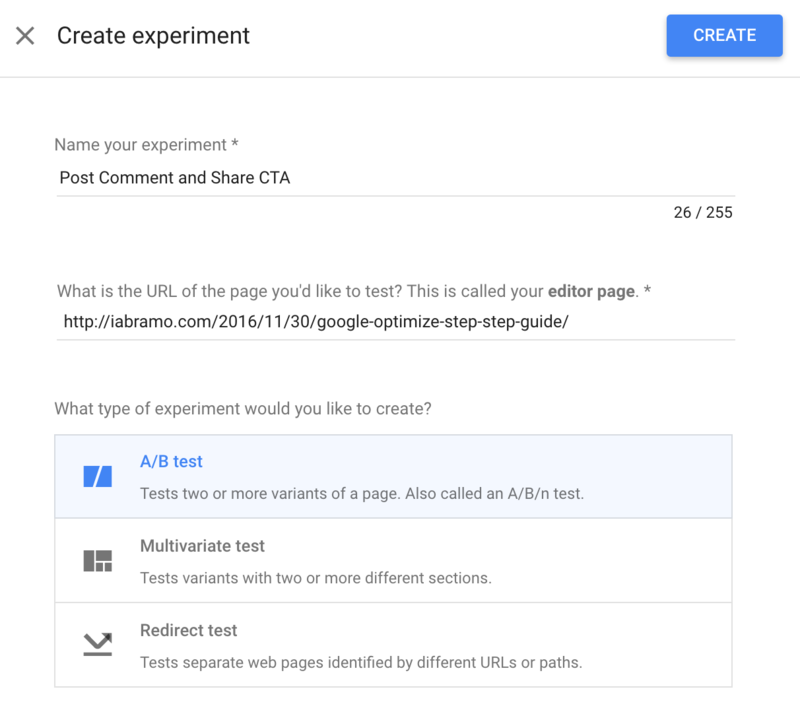 The key advantage with Google Optimize over Google Experiments is that it allows marketers to easily run tests without creating a separate page or knowing how to code. In this article, I will run through the steps it takes to install Google Optimize and set up experiments. Upon creating your account, you will be prompted to create a container. Similar to Google Tag Manager, a container is where you will create all of your experiments. If you plan on managing multiple containers (available to 360 customers) in your account, then name it specific to the site you’ll install it on. For my website, I’ve named it iabramo.com. Now that you’ve created your account and container, you’ll want to link your Google Analytics account. Just select the property and view you’d like to link as shown in the example below. Next, you’ll want to install the container. If you’re not using GTM, then you’ll be provided with a couple code snippets that you’ll want to place in the <head> and <body> on all pages of your website. If you’re using GTM, then it’s as easy as creating a tag that fires on all pages. 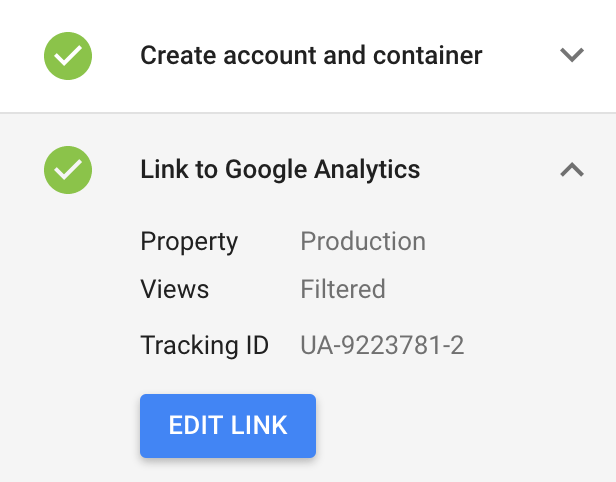 GTM has a built in tag for Google Optimize and all you need to do is put in your GA property ID and Google Optimize container ID. I use a lookup table and constant in GTM for my property and container IDs as you’ll see below. And that’s all you need to begin setting up your experiments. Google Optimize will automatically detect once the container has been installed properly. An experiment is a test you’ll set up in Google Optimize. 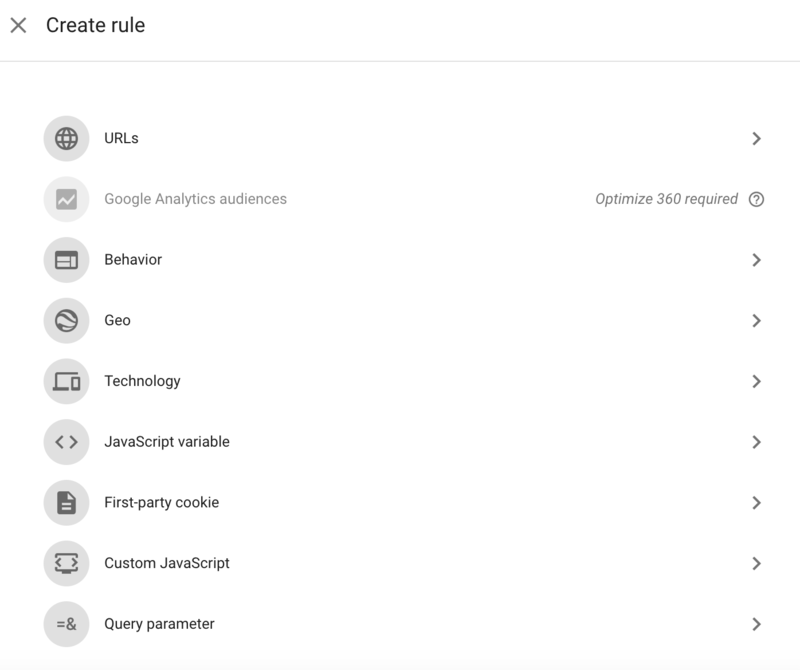 Before you create an experiment, you’ll want to make sure you have goals configured in Google Analytics. Heck, we want to optimize based on conversions, right? If you don’t have any goals configured, I highly recommend you take a step back and put together a measurement plan that lays out all measurable outcomes on your website. Once you have your goals configured, I highly recommend you have a hypothesis to test before you start creating experiments. Website testing shouldn’t be about just guessing what may or may not improve your site. Your website analysis should drive a hypothesis that can be tested. Alright. Now that we have our measurement plan, goals configured and a hypothesis to test, we’re ready to create an experiment. One of the goals of my site is for users to submit comments and share posts because it’s the community that keeps my blog going. I have a hypothesis that including a CTA at the end of the article will drive more conversions and I want to test it for this post. Start by navigating to the Experiments page, click Create Experiment and a panel will appear from the right. Add a name to the experiment and select the type. In this case, I’m going to run an A/B test, but you could also run a multivariate or redirect test as well. If my hypothesis proves right, then I may want to run a multivariate test in the future to optimize the text of the CTA I’m about to add. Now you’ll want to set up your variants, objectives and targets. A variant is what you’d like to test. By default, the original is there to act as your control. Create a new variant by clicking New Variant and a panel will open from the right to name it. Click on the new variant to open up the editor. If this your first time using the editor, you’ll be prompted to install a Chrome plugin. The editor will open up the page you’re running the test on. In this case, it opens up the page of this post. I’m going to scroll down and add a short CTA using the editor by clicking on the last paragraph. When editing the text, you’ll have numerous formatting options like typography, background and borders to choose from. I’m going to make it bold because I believe that will help my chances of getting comments and shares. Click Save and Done at the top right of the screen to return back to Google Optimize. Next, we’ll want to select the objectives that we’d like to optimize our experiment on. This is where your GA goals come in. I’m going to select comment submissions, LinkedIn shares and Google+ shares because those 2 social networks drive my highest quality traffic. Now that we have our objectives set, we’ll want to set the users we’d like to target. The first option to set is the percentage of traffic you’d like to target. I’m going to leave this at 100% because I’d like to get the most amount of volume possible. Next, you’ll have the option to set additional conditions of when you’d like to run the test. I’m going to leave the condition when the URL matches this post, but there are many helpful ways you can narrow down your target. Google Analytics Audiences: Pulls in audiences you have created from segments in your Google Analytics property. This feature is only available to 360 customers, but VERY helpful when you have more complex conditions you’d like to match for your experiment. First Party Cookie: Set the experiment based on the value of a cookie you’ve set on your user. For example, imagine I have a multi-lingual site where i set a cookie based on the language set. In this case, I may want to run a case for users that only have English set as their language. Query Parameter: Set the experiment based on the condition of a value set in a query parameter in the URL. Data Layer Variable: Set the experiment based on a variable set in the data layer. For example, I set a data layer variable of ‘category’ for all of my posts. I may want to target all posts with the category of ‘Google Analytics’. Now that you have the variants, targets and objectives set, you’re ready to run the test. Scroll back up to the top and click on Start Experiment. Click over to the reporting page in the navigation to begin seeing results of your experiment.